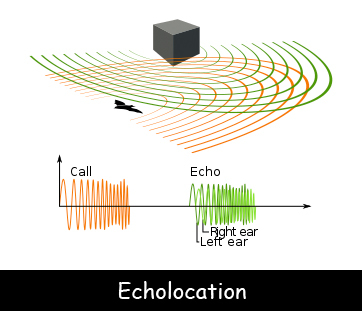 Echolocation can be defined as a process of using sound waves to locate objects that are not in their sight range or at a distance. In the animal kingdom, certain animals like bats, dolphins, porpoises, and toothed whales determine the location of an object by using this method. Mammals developed echolocation as an evolutionary response to life in the dark. It gives them the ability to observe an environment using sound that helps them to find food, navigate their surroundings and become alert of danger. This remarkable high frequency system works in a similar way to sonar. Animals that are able to use echolocation typically have one transmitter and two receivers. This allows the animals to perceive not only the distance of the object but the direction as well. Some bats use the sound to locate their prey as well. They have vocal chords that are modified to emit the high-frequency sounds. In this process, the returning echoes give the animal an image of some parts of the environment. These echoes must be loud enough to return to the animal that is producing the sounds. Some species of bats can’t see well so it is often used in conjunction with their vision. The calls from an average bat can reach up to 130 decibels. The process of echolocation has been broken down into two categories which are low duty cycle and high duty cycle. It works better underwater than on land because it is easier for sound waves to travel through water than through air. Declan, Tobin. " Fun Facts about Echolocation for Kids ." Easy Science for Kids, Apr 2019. Web. 18 Apr 2019. < https://easyscienceforkids.com/echolocation-facts/ >.